The Profit Shortcut review - Scam exposed? All RED FLAGS revealed! Home > Affiliate marketing > The Profit Shortcut review – Scam exposed? All RED FLAGS revealed! Welcome to The Profit Shortcut review! Are you wondering if this system is a scam that will leave you with less money than you have? Or is theprofitshortcut.com your ticket to financial freedom? First of all, I must congratulate you for taking the time to do your own research before investing in another money-making program. There are so many scams out there, so doing your due diligence is the way to leave the scams behind and discover the genuine way to make passive income online! When it comes to The Profit Shortcut, it’s not as amazing as they told you in the sales video. To be completely transparent with you, I am not associated with The Profit Shortcut, so you will not see me trying to get you to join this program. This honest review will show you how this system really works, some facts that you need to take into consideration and my personal opinion. By the end you will be able to make the best possible decision concerning this program! 2 What is The Profit Shortcut about? 3.3 An amazing success rate? 4 Is The Profit Shortcut a scam? What is The Profit Shortcut about? The moment I came across The Profit Shortcut sales page, I thought it was another scam system because it looks like other scam pages I’ve come across in the past. But I didn’t want to come to any conclusions without doing my homework, so I started watching the sales video. I didn’t like the way the sales video started because it showed off some people saying that they have earned thousands of dollars within 30 days after getting started. I mean, their claims made this program look like another get-rich-quick scheme so I started suspecting. After that, the spokeswoman claims she’s going to show you the same method they use to make hundreds of thousands of dollars every single month. This method is said to be beginner-friendly, so it doesn’t matter the experience or skills you have. It can apparently work for everyone. It’s a done-for-you system that can help you earn big commissions without doing much work. Well, that’s what she says. She claims she only needs to work 1 hour a day to earn thousands of dollars a day. Sounds cool, doesn’t it? She supposedly only had to place some ads online to make this system work for her, but it sounds too easy if you ask me. Honestly, the whole sales video is quite overhyped because making money online is not as easy as she makes it seem. There are some important things about this program that she doesn’t mention, so here I am to show you what this is really about. The Profit Shortcut is not even the name of the real program they’re trying to get you into. Remember that some of the testimonials mention “The Super Affiliate Network”? That’s the name of the real program. I remember reviewing this program on this website, so you can check out the full Super Affiliate Network review here. Anyway, I’m going to explain what this program is really about. The Super Affiliate Network is a program that requires you to recruit other people into the system in order for you to make money. Without recruiting other members, there’s no way for you to make the kind of money they talk about. The Profit Shortcut was created by an affiliate of The Super Affiliate Network in order to drive more leads to the program. That’s the reason “Sarah” claims she’s successful if you’re successful. She means that she profits when you make money. Something that “Sarah” doesn’t tell you is that this program is going to cost you thousands of dollars. Yes, $37 is only the beginning of the massive spending. Once you’re inside, you can expect them to try to get you ready to upgrade to the expensive memberships. If you spend thousands of dollars on the memberships, that’s how they get to earn a commission of $1,000 or more. The basic membership will cost you $47 a month, but the Pro membership costs over $2,000! And that’s not all, then you have the Maui Intensive membership that costs over $12,000! The thing is, if you want to earn huge commissions from the expensive memberships, you will have to invest in them! For example, if one of your referrals buys the Pro membership before you, the big commission will pass up to the next sponsor at that level. So if you don’t want to miss out on commissions, you’re required to spend thousands of dollars on the memberships. But that’s not the total cost. The method they use to make money also requires you to invest in solo ads and an email marketing service a.k.a. an autoresponder. You will be paying for the right to rent email lists of other marketers in order to email this system to their subscribers. Note that you could end up spending hundreds (if not thousands) of dollars on paid traffic (solo ads) and still not make all your money back because there’s no guarantee that the people who get sent this system end up joining. When you take into consideration that not everyone has thousands of dollars to invest in a program like this, you realize that it’s going to cost you a lot of money to find the few people who are willing to make big investments. That’s what I don’t like about this program. They’re not transparent about the cost, which means that they don’t help you decide whether or not this is right for you. “Sarah” says that this is completely risk-free, but that’s not true. Yes, you can get a refund, but only for the $37 initial fee. You cannot get a refund for the expensive memberships, which is one of the main reasons this is not risk-free. Another reason there’s a certain level of risk involved is that you cannot get back the money you invest in solo ads or the monthly membership you have to pay for hosting your email list. Because of that, this is a risky business in my opinion. I know all businesses carry a certain level of risk, but this one is riskier than the method I personally use to make a 4-figure monthly income online. Another fake claim that the spokeswoman makes is that they’re having an amazing success rate. The video testimonials can make it seem that many people are achieving success thanks to SAN, but I checked out their income disclosure and it turns out that most members are not making much money. As you can see, most members (rookie rank) are earning an average income of $103 a year. Only 12 people (influencer and leader ranks) are making what you would consider a full-time income. So there you have it. When most members are making less money than they’re spending, I don’t consider it to be a great program. The success rate is very low, in my opinion. The way this system operates is not sustainable because the money only comes from the members who pay for the memberships. The Super Affiliate Network doesn’t provide any tangible products to the public, so they have no retail sales. This is indeed a red flag. People are forced to join in case they want to learn from the training provided. And you know what happens if you only join to learn from the training? They will force you to participate in the business opportunity! It’s clear that most people are joining SAN because of the business opportunity, since the training is focused on getting other people into the program. If their training taught you to build your own business, then it would be great because the business opportunity wouldn’t be the only reason people are joining this program. The problem with this is that when people stop joining the program or the members inside the program refuse to pay for the expensive memberships, the whole scheme will fall down. That’s what happens with programs like this. You see, The Super Affiliate Network operates in a similar way as MOBE and Digital Altitude, two programs that got shut down by the FTC some months ago. They turned out to be pyramid schemes, so I wouldn’t be surprised if the same thing happened with SAN. It’s clear that their business model is unsustainable and this is something that it’s reflected on their low success rate. I mean, succeeding in a business always requires work and time, but when many people who follow the training and take action don’t achieve any success, then there must be something wrong with the system. Is The Profit Shortcut a scam? In my opinion, The Profit Shortcut is a scam because it’s not the name of the real system. Not only that, the sales video is very misleading because it’s full of empty promises so it looks like a total scam. The spokeswoman claims to be Sarah Highland but she doesn’t even show up. She doesn’t show any picture of herself, so how can we trust this person? She makes some fake claims and uses scam tactics to get you to buy into this program. For example, she tells you that there are limited spots available when in reality there’s no limit when it comes to the amount of people who can sign up. If you think about it, they want as many people as possible to spend their money on this program, so the limited spots left claim is complete BS. Apart from that, she’s not honest about the way this program works or the cost, so I think it’s fine to say that The Profit Shortcut sales page is like a scam page. When it comes to The Super Affiliate Network, it’s not a total scam because they give you something for your money. But it’s very expensive, unsustainable, done-for-you and definitely not a beginner-friendly business model. It’s a “pay-to-play” system that requires you to spend a lot of money just to participate in their affiliate program, which is another big red flag because affiliate programs are usually free to join. I personally never recommend “done-for-you” programs like this one because they keep people dependent and don’t encourage creativity. So, after everything I have explained, my final conclusion is that I don’t recommend The Profit Shorcut. When it comes to making money online, it’s best that you build your own business because a done-for-you system will always keep you dependent. I remember getting involved in this kind of systems some years ago and feeling something was not right about them, so I stopped wasting my time on them. I’m grateful that I found a sustainable, newbie-friendly business model that has made it possible for me to earn a 4-digit monthly passive income online. This business doesn’t require you to recruit other people and you don’t even have to promote the same products as everyone else. There are lots of products and services that you can earn money from and you are not even required to buy them. This business doesn’t require you to spend thousands of dollars to make it work. In fact, you can get started today for free! To add to it all, you also get the opportunity to receive free help and support from me and other like-minded people who want to see you achieve success! So what will you do? Will you keep joining unsustainable done-for-you systems or will you start building your own system today? 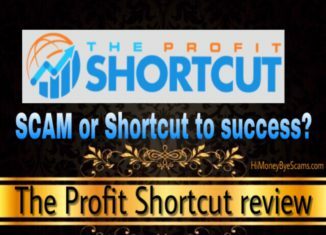 I hope this honest The Profit Shortcut review has been helpful to you and you will make the best possible decision. Will Amazon From Home scam you? AmazonFromHome.org review exposes this fraud! Copysuccess.me review – Is Copy Success a scam or not? Is 700 Profit Club a scam or legit? Is Profit 24-7 a scam? 4 UNTOLD TRUTHS revealed here!